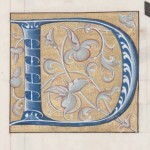 This ever growing collection of images that contain a full set of the alphabet or a group of similarly designed letters could be used for a variety of craft projects. Along with scrapbooking, many of these images could easily be turned into the makings of an embroidery sampler. With a little cropping, selected letters could also be removed to create drop caps and other effects. A huge group of illuminated letters from a 16th century manuscript. Letters are on a beige background with red, blue, orange, green and black decorations - some even gilded. Book plates with complete, or almost complete, sets of letters. All are in the public domain and can be used as a group or individually. Charming set of vintage images that feature letters of the alphabet decorated with cute children dressed in red and white. 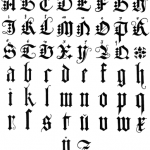 Print foundries sold full sets of engraved alphabet letters to publishers. I have found the pieces of this set across a number of books and magazines.